We love big dogs; a good friend of ours has a Great Dane, and we think the world of him. However, with a large dog comes large responsibility. Larger breeds like mastiffs and Great Danes are more likely to develop diseases like arthritis in their lifetime than other dogs. However, it should also be noted that several things can contribute to arthritis, such as: dislocation, trauma, family genetics or trends within breeds. We love our pets, and we’d like to keep their comfort level at a maximum, so investing in preventative care is a necessity. That’s why we're going recommend some of the best orthopedic dog beds large dogs can use. Check it out, and as always, let me know if you have any questions in the comments. Well for one, using a dog bed will prevent damage to your expensive seats. Although we love our dog dearly and sometimes allow her to get on furniture, we also prefer not to have her on leather. We just can’t afford to replace it. More importantly, dogs should not lay on hard surfaces like wood or tile. This is especially true for large breeds. The hard surfaces can cause dogs to develop calluses and injure the area around a bone protrusion such as the elbow or knee. If you have a 5 pound Yorkie, then you probably don’t need to go all out and get a bed fit for a Great Dane. However, since you’ve made it this far down the article, we’ll assume you have a large breed dog. You need to go bigger. You want your large dog to have enough room that he’s comfortable at all times. Also, big beds are good for dogs with joint pain. This depends on the dog and their needs. The more prone to joint problems, arthritis, etc. the dog is, the better off they will be in a heated bed where they can relax their muscles and joints. However, a large portion of orthopedic beds will come with components that offer heating and cooling options. There are a few different types of materials that can and should be used in an orthopedic dog bed. You will just need to decide which type is best for you dog. Memory foam tends to be a material that large dog owners choose quite often. It has a great balance of being incredibly comfortable, and it’s also supportive of your dog’s joints and bones. Why Go With the Heat Therapy? Many orthopedic beds will come with an option for heat and cold therapy. This is an excellent way to help ease your dog’s sore muscles and joints. Heat causes blood vessels to expand, and it increases circulation to your dog’s muscles. This is great for preventative care and to help heal your dog. This is also great for dogs who are suffering from an injury, arthritis, or both. On the contrary, a lot of orthopedic beds usually have cooling components. This can provide muscle and joint therapy (think Icy Hot patches). However, they are mostly for keeping our large pups from getting over heated in the summer months. They are great for keeping your dog’s body temperature under control. This can also help with temperature therapy when trying to ease soreness with your dog. What are the Best Orthopedic Beds for Large Dogs? 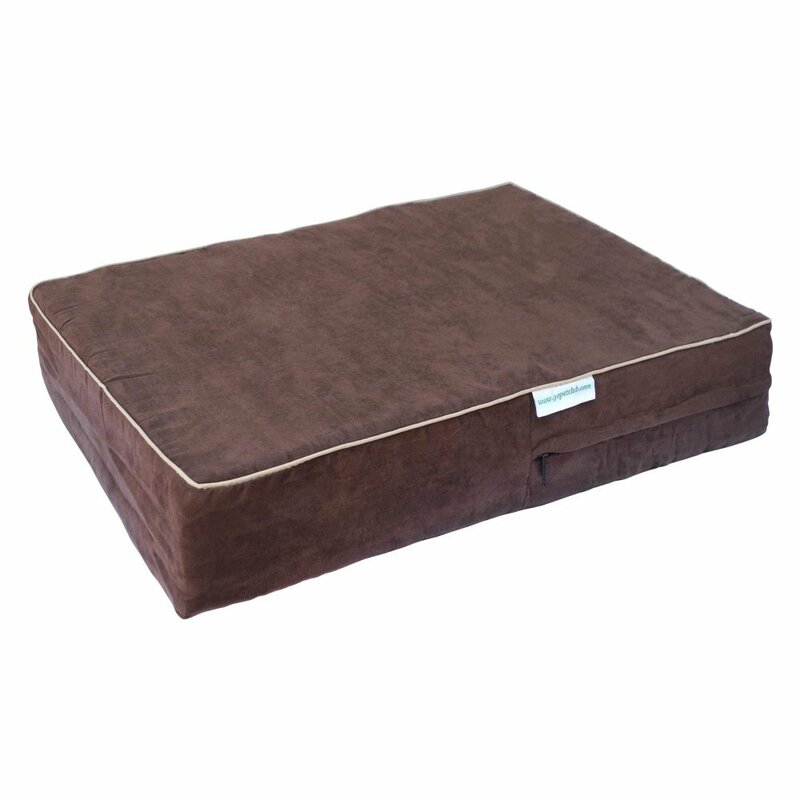 The Brindle memory foam orthopedic dog bed is made from high-quality, 4’’ thick memory foam to give your dog maximum comfort. It also comes with a removable, waterproof velour cover that protects against bodily fluid, hair, and dirt… you know, dog things. It’s soft, supportive, and it helps relieve arthritis and other causes for achy joints. It’s important to note that this bed is firm without being stiff. This translates to the bed being supportive but not so hard that it will hurt your dog. The bed won’t sink in the middle, and it likely won’t wear down too quickly. It’s a great bed. That being said, we definitely recommend it. This is one of the best orthopedic beds we’ve been able to find. our pup tested it, and she really liked it. 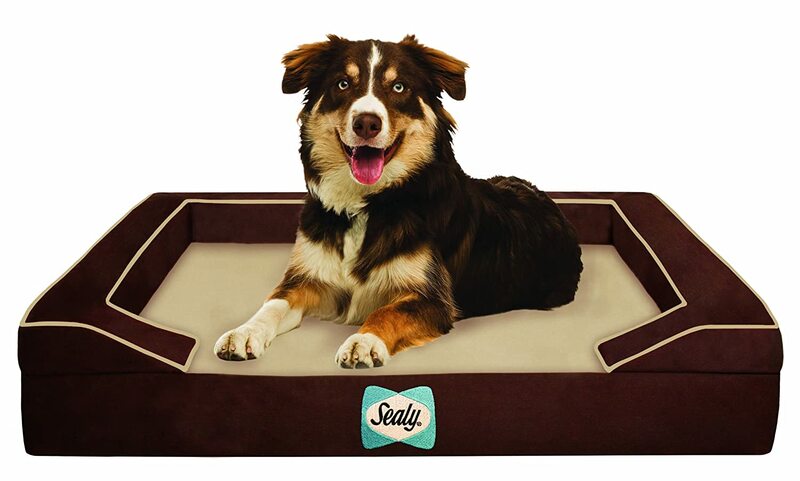 Many people have purchased this bed to help their dogs ageing and/or help them through recovering from an injury. Additionally, the Big Barker is very easy to clean. Usually you just need to give it a quick vacuum, or you may need to wipe it with a damp cloth. All in all, this is a great bed. I’m sure you’ve heard of Sealy. They make top of the line mattresses for humans. In fact, I have one! Well, they’ve adapted their cutting edge technology and started making dog beds as well. 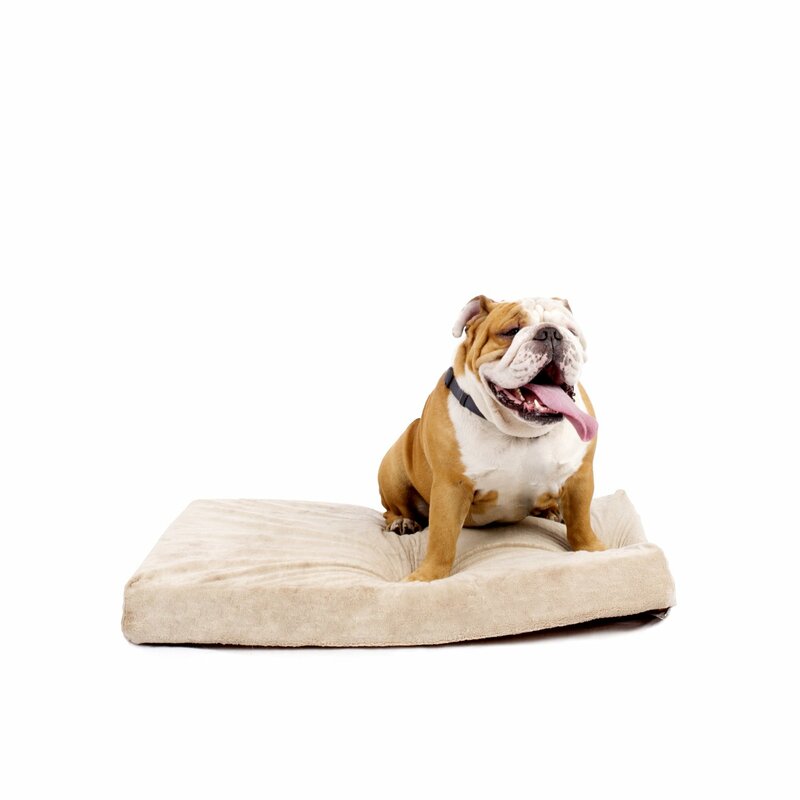 It’s safe to say that this dog bed will work wonders for you pup. It comes with loads of features all packed into a solid dog bed. Some of the features include: cooling energy gel, memory foam pad, bio-green orthopedic foam, and removable covers. This will make it easy to clean. The cooling energy gel is excellent for helping your dog’s muscles and joints. It will also help keep your dog cool during the summer months. We don’t want him to get overheated do we? 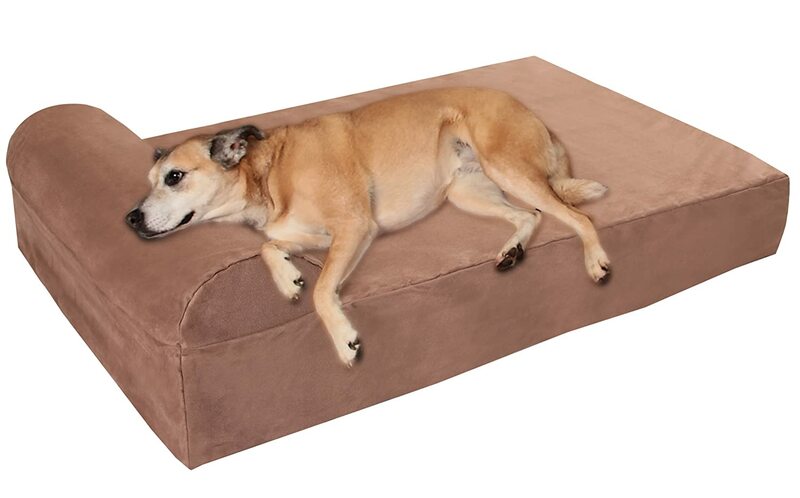 This is an excellent dog bed made by a trusted manufacturer. This is the least expensive bed in the bunch, but it still made the list! The great thing about this bed is that it’s simple, yet effective. The memory foam is firm but not stiff. It will help your pup recover and age with ease. It comes with a 4” orthopedic memory foam pad, and it won’t likely flatten over time. It’s designed to relieve your dog’s aches and pains, and just about everyone we have talked to has agreed that it does the job!